The temperature is cooling and the leaves are starting to change colors. There’s no better way than to get out, hike and explore nature around where you live. 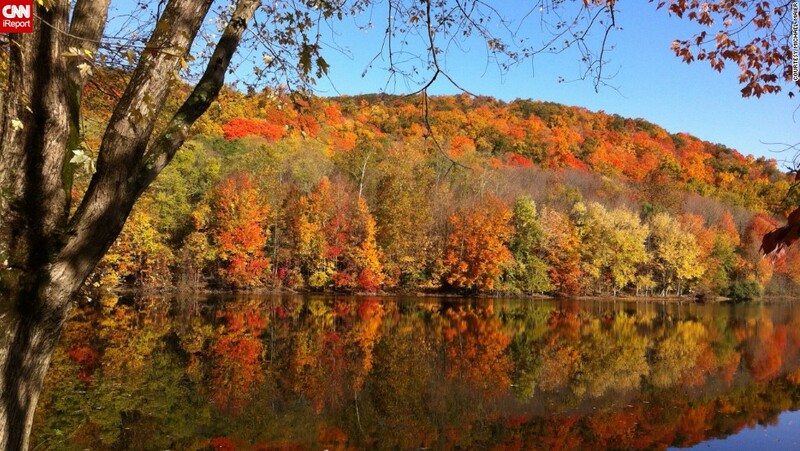 If you’re living in New Jersey, you can be guaranteed to see an amazing display of stunning fall foliage. If not, you can still enjoy the fall photos below. Get your hiking boots on, grab some water, bring a furry friend and head out to these trails below. You won’t be disappointed, and did we forget to mention – hiking makes you happy! Trail Notes: One of the best views in New Jersey is Wyanokie High Point. The trees and the majestic colored leaves are mesmerizing and very easy to get to. To get there, start on Otter Hole Trail and when you get to Hewitt-Butler Trail, follow this trail to Wyanokie Circular Trail. Continue on this trail until it splits up to Mine Trail. When you see this trail, just continue on with Roomy Mine Trail. There you’ll be able to see Wyanokie High Point. Why It’s Great: Wyanokie High Point features stunning fall foliage together with breathtaking skyline views, and also overlooks the Wanaque Reservoir. In addition, you’ll be treated to an old copper mine, as well as many streams and unique rock formations. Trail Notes: This 4.5-mile hike explores Hooks Creeks Lake, Perrine Pond, and terrain ranging from beatiful fall forests overlooking salt marshes. To get to Cheesequake State Park, simply follow the Yellow Trail to the Blue Trail until you reach the Green Trail. Why It’s Great: There’s plenty of vegetation, salt marshes, forests and wetlands. All of these look amazing during the fall. In addition, it’s all easily accessible by hikers and bikers. Trail Notes: Start off by taking the Long Path at State Lien Lookout and move your way around the park. You can’t miss the fall trees and leaves. Why It’s Great: The Hudson River is why you want to visit this park. State Line Lookout also gives you a taste of Greenbrook Sanctuary which is a secluded woodland preserve. There are also historic sites including Kearney House (a nineteenth century tavern) where you are surrounded by fall leaves. Have a picnic here and surround yourself with fall! Check out the Remaining Top 5 next Page! Trail Notes: Go up the Upper Trail and then use the Lower Trail to hit Black River. Why It’s Great: This short trail offers beautiful streams and views of the Black River. 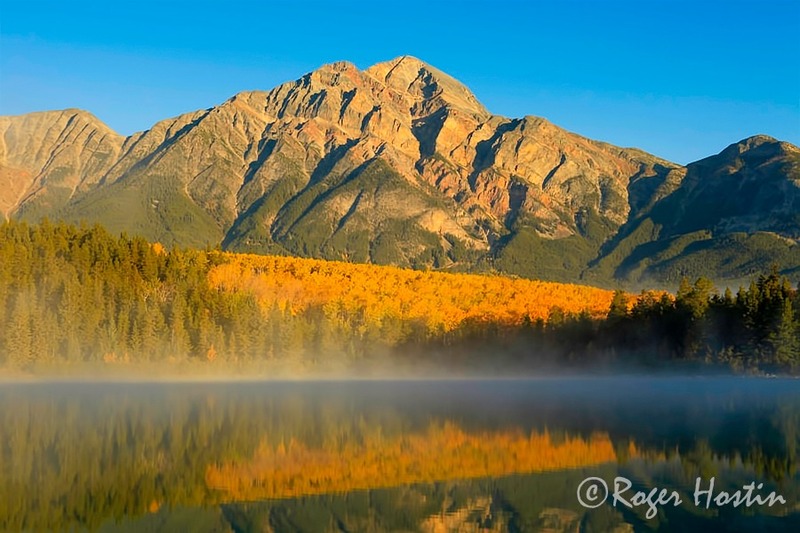 It’s best to see the leaves change color earlier in the season. Trail Notes: This is quite a hike but definitely worth visiting. The scenic 7.5-mile hike overlooks Buttermilk Falls, Crater Lake, Hemlock Pond. All these trails lead into the famous Appalachian Trail. Why It’s Great: Buttermilk Falls is NJ’s highest waterfalls and a favorite destination of visitors to the park. 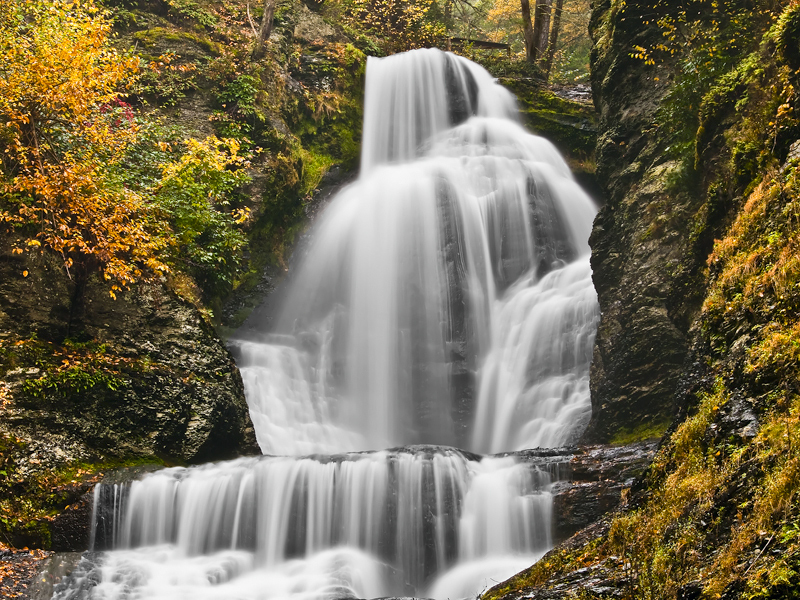 There’s plenty of fall leaves to be seen at these falls. Be sure to plan your hike after a period of rain to get the best views of the waterfall. Trail Notes: The trail starts along Rampapo Lake and goes through Van Slyke Castle. If you follow the MacEvoy Trail for around 1.5 miles, you’ll end up at Castle Point Trail. Hours: 8 a.m. – 8 p.m. until November 1, when the trails will close at 6 p.m.
Why It’s Great: This much visited park is best known for the skyline of New York. You’ll see the world’s most recognized skyline through the beauty of fall leaves. Hikers can mix and match routes depending on their interests and time. 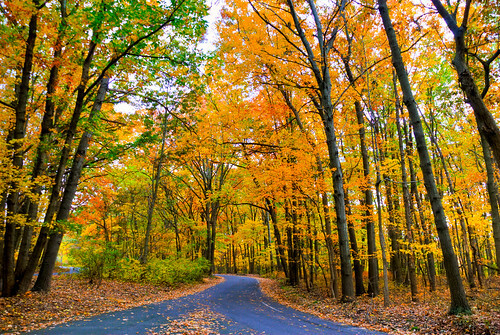 Click Page 3 for The Top 2 New Jersey SECRET Fall Locations! Trail Notes: This Appalachian offshoot is a 7.8 mile hike from Dunnfield Creek Trail. Why It’s Great: The hiking terrain is very rock so make sure you are prepared. You can enjoy breathtaking views of Delaware Water Gap and Sunfish Pond, a stunning glacial lake. Trail Notes: This is a moderately challenging trail and preparation is required. This hike starts at the parking area then continues onto the scenic overlook. Here you’ll see the fall trees in glorious colors. Continue onto Taylortown Reservoir and you’ll get some very nice picture opportunities. 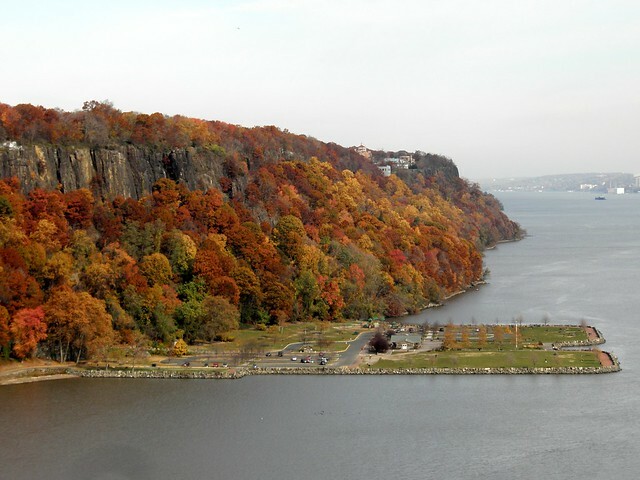 Why It’s Great: Seeing New York’s skyline with fall trees to complement is the utmost reason you should visit. Also, you’ll get an up-close look at Tripod Rock, the wetlands and the melding of rocks, yellow fall foliage and striking waterfalls.